Friction tuners have a bad reputation. But there’s nothing bad about them one learns how to use and adjust them appropriately. Because, from time to time, their tightness needs to be adjusted, especially on new instruments or when our ukulele has to adapt to new humidity conditions. So if you are going out on a trip or to a gig, it’s probably a good idea to put a screwdriver in your suitcase (don’t forget to throw a towel in there too). The way it works is very simple: a screw in the top part of the peg controls the pressure applied in between the metal plates located in the front and back of the tuner. Tightening/loosening the screw with small turns (an 1/8 turn already makes a significant difference), we can set each tuner as it should be. When turning the screw to the right, the tuner gains strength, when turning it to the left, we make the tuner softer. The best thing is to leave them as soft as possible without having them going backwards while tuning. On the other hand, since the turning ratio is 1:1 in order to get an accurate and stable tuning, it is recommended to tune by increasing the tension (i.e, if we need to lower the note, we lower a little more, and turn it up again). 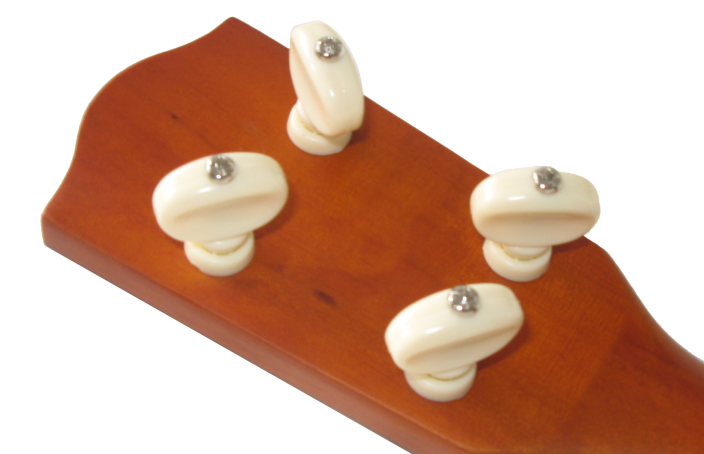 With a bit of practice, friction tuners are as manageable as mechanical tuners. And with or without practice, in my opinion, they look nicer.